Hey Suckers, here be the mighty and whitey 'Whitey Hiss' cassette. 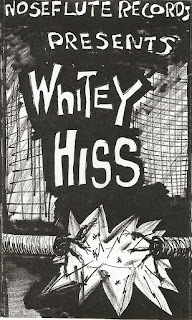 It sure is Whitey and Hissy and Dirgy and raw as Demerara sugar. A project of Mikey Hex who was best known for his band 'Squirm', Mike had other things on the go too. This was one of his babies & also released on his own fledgling Label 'Noseflute' (which also put out the second Squirm album by the way). Four songs are presented here on one side of a C60 generic cassette. If you read the fine print on the artwork (supplied with download) it suggests you should make a compilation with the blank space. Generous to the end Mike. I'm assuming Mike gave me this cassette too at some point or other. We used to rehearse at Hex Central (his abode & Venue in downtown ChCh) as did a few others like Ape Management etc. It was a rockin' place & Mike was the purveyor of thee rockin' site. Many a band owe him big time for looking after them. He was always enthused & always positive about the future. My favourite memory of him is sitting in His Lordships Hotel (downtown ChCh) one night when there had been numerous fights at the bar (one guy was unconscious on the floor for a while... ) and Mike, myself and some others at the table came up with some anti-fighting sing-along which we would kick off as soon as another fight erupted. Hilarious drunken revelry.